CHECK BACK OFTEN FOR NEW PRODUCTS COMING REGULARLY! WHILE SUPPLIES LAST - This is the last of the formulation that does not contain Sodium Laurel Sulfate (SLS). We will not carry this product after supplies are all sold out. 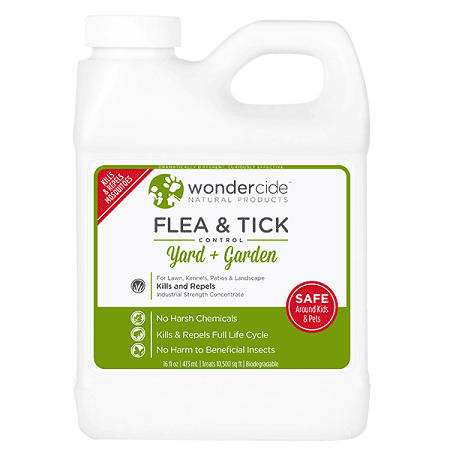 Wondercide's Natural Flea, Tick & Mosquito concentrate for dogs and cats is formulated with organic, food-grade ingredients to be safe, effective and easy-to-use. Simply spray and play without worry of chemical pesticides, drops or pills. Use as needed to kill on contact and repel parasites. Cedar fragrance. Yard + Garden is a natural outdoor flea & tick control concentrate that kills and repels fleas, ticks & 100s of other pests, while being safe for beneficial insects. For best results, apply with a Pre-Mix Hose End sprayer. To treat active flea & tick problems, use 8oz dilution. For routine prevention of pests, use 6-8oz dilution. Organic, therapeutic-grade cedar oil is the active ingredient in Wondercide Flea & Tick Control for Pets + Home and Yard + Garden. Cedar oil has been used for centuries to manage pests – think Grandma’s cedar chest! Cedar is a sustainable, naturally occurring, renewable resource, and Wondercide’s cedar oil is produced by steam distillation with a proprietary fractionating process that renders it phenol-free. Cedar oil affects octopamine, a compound that is essential to life for pheromone-driven “bad bugs” like fleas and ticks. Octopamine is responsible for regulating heart rate, movement and behavior in pests. It’s essential for life. Cedar oil blocks the octopamine neurotransmitter receptors in pests, causing them to be repelled from the area. When contacted with the cedar oil in Wondercide's Flea & Tick Control products, pests suffocate and die. Mammals, birds, fish, amphibians and beneficial insects are not affected by cedar oil because they do not have octopamine neurotransmitters, and that's why this powerful pest-killing solution is so safe for pets and families. How Much Yard + Garden Do I Need to Kill & Repel Fleas & Ticks? You should purchase enough Yard + Garden to do 2 initial treatments of your outdoor areas within 7-10 days to establish control and eliminate the full pest lifecycle, and then reapply for prevention every 30-45 days, or after heavy rain. The longer you use Yard + Garden for prevention, the less you'll need to apply. The key is establishing control and then keeping it! For PREVENTION and maintenance, we recommend applying a 6-8oz dilution every 30-45 days, as needed, or after heavy rain. Exact application instructions are below. Dilution ratios vary by application. Stronger mixtures will enhance results without damaging side effects. For best results treating active flea & tick problems, we recommend our House Treatment Kit. This will ensure you're also treating your pet and home to fully eliminate the problem. To treat an active problem, you must apply twice within 7-10 days to ensure you break the egg cycle. We recommend the Hose End Sprayer method when applying for treatment of active pest problems. Using a pre-mix hose end sprayer, pour 8oz of concentrate and fill to the top with warm water. Using a dial sprayer, add enough concentrate for your coverage area and set to 1 TBS. Fogger: For outdoor applications, mix 8oz of Yard + Garden per gallon of water for mosquito and flying insect control. Misting System: Mix 16-25oz Yard + Garden in 50 gallons of water. Adding water is the preferred way to initially mix this soluble solution. Increase frequency and duration to improve performance levels. Irrigation System: Injection rates of 1,500-2,500 to 1 provide satisfactory delivery of Yard + Garden during 1 to 2-minute watering cycles. Adjust injector controls to increase or decrease usage. Increase delivery time for enhanced performance. Laundry: Mix 2 oz per wash load, along with laundry soap for a repellency effect on pet bedding or other laundry items. As with any pest control maintenance schedule, how often you apply Yard + Garden will depend on your local pest pressure & critter population. Critters like raccoons & squirrels are known carriers of parasites. Insects like fleas, ticks, & mosquitoes thrive in moist, warm, shady areas. In general, a 30-45 day routine treatment or application after heavy rain is the best practice and usually the cheapest solution for pest management. Stronger mixtures enhance results, but you may find that you can use a weaker dilution as you do ongoing prevention. Hose End Sprayer: Using a pre-mix hose end sprayer, pour 6-8oz of concentrate and fill to the top with warm water. Using a dial sprayer, add enough concentrate for your coverage area and set to 1 TBS or 2 TSP. Compression: Mix 4oz of Yard + Garden per gallon of water. Use one gallon of solution per 1,000 sq ft of surface area. Fogger: For outdoor applications, mix 6oz of Yard + Garden per gallon of water for mosquito and flying insect control. Irrigation System: Injection Rates of 1500 to 2500 to 1 provide satisfactory delivery of Yard + Garden during 1 to 2-minute watering cycles. Adjust injector controls to increase or decrease usage. Increase delivery time for enhanced performance. Laundry: Mix 2oz per wash load, along with laundry soap for a repellency effect on pet bedding and other laundry items. Directions: Apply product with any trigger, compression or tank sprayer. Can also be used with fogging equipment, hose end sprayer, dial hose-end sprayer, misting system and in laundry. Not for use on plant life. NOTE: AVOID CONTACT WITH EYES. Not for use on birds, snakes or fish. Not for use indoors. The active ingredient is octopamine, killing and repelling insects instantly. Octopamine is only found in insects, so product is safe for use around pets and people. We use this product any time we see fleas or ticks on our animals or in the environment. It's all natural and safe for family and fur kids. We use the Only Natural EasyDefense Pet Tags to prevent reinfestation. One tag lasts an entire year and is all natural as well. 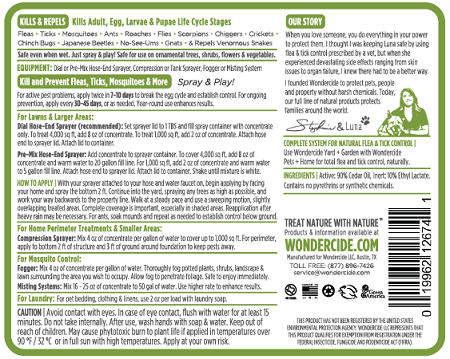 NOTE: WE NO LONGER OFFER THE WONDERCIDE PET SPRAY PRODUCTS DUE TO A CHANGE IN FORMULA THAT ADDED SODIUM LAURYL SULFATE. ALTHOUGH WONDERCIDE's POSITION IS THAT THIS IS SAFE TO USE, WE HAVE TAKEN A CONSERVATIVE APPROACH AND NO LONGER USE THIS ON OUR PETS. WE HAVE SWITCHED TO CEDARCIDE, AN OLDER FORMULA THAT DOES NOT CONTAIN SLS. THIS CONCNETRATE DOES NOT CONTAIN SLS. Copyright The Dog Breeder Store. All Rights Reserved. eCommerce Software by 3dcart.